A pictorial introduction to the history of St Patrick’s Cathedral Melbourne. Fr Patrick Geoghegan OFM arrived in 1839 to be the first priest in the Port Phillip settlement of the colony of New South Wales. What was the position of the Catholic Church in Australia at that time? You can get some idea from this brief outline of the history of Catholic Church in Australia and its shaky beginnings at Sydney Cove. Another site describes its origins amongst the convicts and settlers of the first years. The Port Phillip district was part of the Sydney Church in the early years but when a township was established on the Yarra River a priest of its own was clearly needed. When Fr Geoghegan (pronounced Gaigan) arrived in Melbourne in 1839, he organised firstly a wooden chapel and later a substantial building designed by Samuel Jackson, named for St Francis which quickly became a Melbourne landmark. In 1847, he created the new parish of St Patrick at the eastern end of town where the government had granted land for a church and school. You can get a feel for what it was like to be a Catholic in these very early days of Melbourne by reading Chapter 2 of a family history of the Clancy family. The MacKillop family features in this memoir. Alexander McKillop was a prominent member of Melbourne’s early Catholic community and of course was the father of Blessed Mary MacKillop who will soon become Australia’s first canonised saint. Read about Melbourne town in these early years on either the museum site entitled Marvellous Melbourne or in another excellent site housed at the State Library of Victoria (which has also a very useful teacher resource which might help you and your students gain the most from this pictorial history of St Patrick’s). The Whitehat site, really directed at tourists, briefly and in accessible language introduces Melbourne’s early days. It also contains links to short extracts from a variety of writings of the time. Unfortunately it is incomplete and finishes at the time of the Gold Rushes. For some pictures from Melbourne’s boom and bust period of the 1880s and 1890s, see the National Gallery site. Bishop James Goold, the first Catholic bishop of Melbourne arrived in 1848. It was probably not long after this that he began thinking of a suitable place for a Cathedral. The story of Melbourne and of the Melbourne Catholic Church is reflected in the story of the Cathedral. • When Bishop Goold first arrived in 1848, Melbourne was still a smallish settlement and the early attempts to build a Catholic Church on Eastern Hill reflected the essentially modest expectations of the town and of the Catholic community. • Goold’s decision in 1858 to commission the magnificent building William Wardell proposed reflected the wealth and new confidence of the Gold Rush era, the increasing self assurance of Australian Catholics and their desire to make their mark. • The time the Cathedral took to achieve final completion (1858-1939) reflected the ebb and flow of economic life in the new city, the periods of ‘boom and bust’, the trials and tribulations of the new city and its citizens. • Finally, the construction of the Cathedral (in close proximity to Parliament House begun in 1854) and overlooking the business district symbolises both the involvement of Catholics in the public life of the city from the very first and also some of the tensions between Church and State in that period. Some excellent essays on the Life and Times of the Cathedral, its Archbishops and its architect can be found on the very attractive St Patrick’s Cathedral website. The outstanding personalities associated with the building of St Patrick’s Cathedral are of course its founding bishop James Alipius Goold, his successors, Archbishops Carr and Mannix; its English architect William Wardell and the first Dean of the Cathedral, Fr. John Fitzpatrick, who was intimately involved in the St Patrick’s project from its inception until his death in 1889. James Alipius Goold was appointed Melbourne’s first Bishop. In 1850 he laid the foundation stone of St Patrick’s church, designed by Samuel Jackson, architect of St Francis. But after gold was discovered in 1851, Melbourne boomed and it was clear that a larger Church was both needed and could be afforded by Catholics. After a further attempt at a larger church (almost complete in 1858), he accepted the extraordinarily impressive plan of English architect William Wardell for a grand gothic cathedral and from 1858, the great cathedral began to take shape. His diaries show that Bishop, later Archbishop Goold was a tremendously energetic, hardworking, pastoral man, deeply attentive to his prayers who was also quick to read the ‘signs of the times’. He was also very ambitious and single-minded. It is easy to imagine how cross Melbourne’s first Catholics must have been when with all the financial demands on them, their Bishop decided to dismantle the first two St Patrick’s in favour of the present outstanding building. He was strong enough to withstand this disapproval. His faith in the future of Melbourne and in the generosity of the Catholic people was extraordinary. William Wardell a gifted English architect who had become a Catholic aged 19. He had studied under the famous English Gothic revivalist Augustus Welby Pugin and had made a good name for himself in England when his health failed and he was advised to seek a warmer climate. He arrived in Melbourne in 1858 and within months was engaged on the St Patrick’s Cathedral project. He was also employed as chief Inspector of Works and was responsible for many magnificent buildings around Melbourne in both Italianate and Classical styles. A notable example of the latter is Government House. He was also immensely busy supervising public works including such various projects as the Gippsland Lakes and Warrnambool Harbour as well as interstate work. Much professional jealousy surrounded him and sectarian feeling was also directed against him. After losing his job as Inspector of Works together with other civil servants in 1877, he and his family moved to Sydney though he continued to play a significant role in the completion of St Patrick’s and its decoration and furnishing. He was present at its consecration in 1897. At Archbishop Goold’s death in 1886, there was still much work to be done on the Cathedral. Archbishop Thomas Carr pushed it steadily on. Even when the depression of the 1890s hit and contributions and donations slowed right down, he still managed, by personally spearheading fund raising efforts, to ensure that when the Cathedral was dedicated in 1897, it was substantially debt free. Archbishop Carr was an affable, moderate man, well liked by fellow bishops and those public figures in Melbourne with whom he worked closely. To read more about Archbishop Carr, who made a tremendous contribution to the setting up and growth of the Catholic School system in Melbourne, see the entry in the Australian Dictionary of Biography. 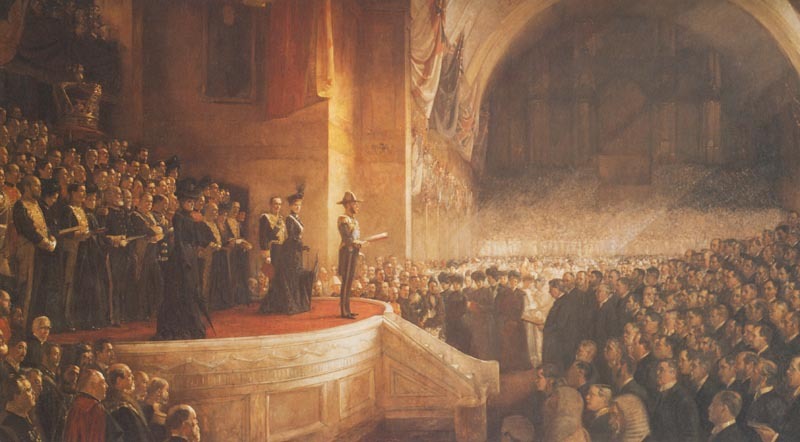 Archbishop Carr is very regognisably portrayed by his friend Tom Roberts at the opening of the first parliament of the Commonwealth of Australia at the Exhibition Buildings in 1901. Can you spot him in his episcopal robes in the left foreground of the Federation painting? If Goold is remembered as the man who had the foresight to see that Melbourne would become a major city and warranted a splendid Cathedral and Carr is remembered as the genial man who saw to it that the Cathedral was brought to completion, Dean John Fitzpatrick is hardly remembered at all except by those familiar with the history of St Patrick’s. Fr John Fitzpatrick had come from Ireland with Fr James Goold and others as young priests and it is perhaps he that ought to be remembered as the person most completely involved with the building of St Patrick’s from its first inception in 1858s to its near completion in the 1890s. It was he, who in Bishop Goold’s absence in 1858, met with William Wardell and invited him to prepare plans for the cathedral on Eastern Hill. It was he who from the day the cathedral plans were agreed to, implemented Wardell’s vision and watched it take shape, not from afar, but on site day by day. It was his cassocked figure that was often in and about the cathedral and even on walk ways high above the nave, inspecting, discussing, advising and generally enjoying the business of building. He spent his own personal income on it, supervised and collaborated with the builders and craftsmen and initiated appeal after appeal for funds to complete it. Though he died before it was finished, he is buried within St Patrick’s, fittingly, opposite Archbishop Goold, in the Chapel of the Holy Souls. Archbishop Daniel Mannix was the third archbishop of Melbourne and inherited the completed and fully paid for St Patrick’s. His especial contribution to the Cathedral was the erection of its triple spires, now so much the signature note of St Patrick’s. They were raised in 1839 the year marking the centenary of the Catholic Church in Melbourne. He was keen that the Cathedral should make its presence felt in the city streets. Parliament House had blocked the view of St Patrick’s which would have been available the length of Bourke Street, so Mannix directed that Wardell’s spires be increased in height so that they soar above Parliament House and are firmly and permanently ensconced in the city landscape. Archbishop Mannix’s long and vigorous episcopate would fill a couple of websites. Read a biography from the ADB or listen to part of an interview with him in his old age discussing the Conscription issue on which he took such a strong and controversial stand during World War I. In 1839, four years after Melbourne was settled, Fr Patrick Geoghegan, an Irish Franciscan became Melbourne’s first priest. Use this Wikipedia entry to find out how many Catholics were in Port Phillip in 1841? How do you think they had practised their faith before Fr Geoghegan (pronounced Gaigan) came? Write a headline that expresses Catholic feeling about his arrival. What problems and challenges might he have been thinking about as he sailed up Port Phillip Bay to land in the new settlement? Work out how old Fr Geoghegan was when he arrived. Would he have looked this way then? What clothing is he wearing and what does that tell you about him? What would be the typical sounds of the Port Phillip settlement in 1839? Could a group prepare a sound-scape of early Melbourne town. Prior to Fr Geoghegan’s arrival, Melbourne Catholics had met in each other’s homes for prayers together and Mrs Catherine Coffey taught a catechism class for the children. Can you find out what prayers (scan down to last line of paragraph 2 in this extract from an old newspaper) might have been said when Melbourne’s first Catholics got together? What else would likely have happened at these gatherings? What topics of conversation might have been part of the evening? Imagine being in Mrs Coffey’s catechism class one sunny Melbourne morning in 1839? What’s going on outside the window today (sights, sounds, smells)? Ask your grandparents about learning the catechism – maybe they have theirs still that you could borrow and bring to class. Do Catholics still have catechisms these days? How have you learnt about our faith? Think of three interesting questions about her faith, her pupils, her experiences etc., you would like to ask Mrs Coffey if you could. On 19th May 1839 in a partially completed store on the corner of Little Collins and Elizabeth St, Fr Geoghegan and Melbourne’s first Catholics celebrated the first Mass using a trunk belonging to Mrs Coffey as an altar. Why would a store be chosen as the venue for the first Mass and who might it have belonged to? Why do you think they used a wooden trunk rather than a table for the altar? Look carefully at the trunk – Mrs Coffey very likely brought it with her from Ireland. Imagine you are the trunk. Tell your story: Who made you? Where and when? How did you come to Port Phillip? Who was your owner? What was she like? What was packed in you? Why are you one of the most famous trunks that ever came to Australia? Can you name the vessels and vestments illustrated in Screen 3 that were used at the first Mass? What similarities/differences do you notice between the vessels and vestments used at Mass then and now? Sunday 19th May 1839 was Pentecost Sunday. What connections might Fr Geoghegan have made between that feast and the first Mass in Melbourne? Write a few notes for his sermon or homily. The vestments you see in this picture are very faded now, but if it was the feast of Pentecost, what colour would they have been in 1839? What might other Melbournians have been thinking as they saw the Catholics walking up Elizabeth St for Mass? The first St Francis on the corner of Elizabeth and Lonsdale Streets which was made of floor boards was built soon after Fr Geoghegan arrived. The present Church was finished and dedicated in October 1845. What do you see in Liardet’s picture? Make a careful note of everything depicted. What does this picture tell you about the first community of Catholics; about colonial Melbourne? Imagine yourself as one of the people in this picture: Write down what you have been doing before Mass and/or what you plan to do after Mass.Even though this poem was written about half a century later and set in a country town it might give you some ideas (Melbourne itself was like a country town in the early days). Alternatively, insert speech bubbles for four or five of the people in the picture. Until the 1960s, Mass was said in Latin. This is the Our Father in Latin. Print out a copy and compare it with the English ‘Our Father’. Can you see some connections between the two languages? What language was the ‘Our Father’ first written down in? As the numbers of Melbourne Catholics grew, Fr Geoghegan divided the church into two parishes with Swanston St as the dividing line: St Francis’ to the west and St Patrick’s to the east. When you look carefully at this 1839 map of Melbourne, where are most of the dwellings and buildings located. What does this tell you about how Melbourne developed in the 1840s? Find out more about the Melbourne street grid on the State Library site. The streets of Melbourne are laid out very neatly. Would the streets have really looked so neat in the 1840s? How did people get to Mass in early Melbourne? Why do you think Fr Geoghegan chose Swanston Street as the boundary line between the first two Melbourne parishes? The first gatherings of what would become the St Patrick’s parish were in a wooden house at the eastern end of little Collins St. This is what Collins St looked like then. In July 1848, Fr Geoghegan’s application for land for a church was rewarded by the grant of a site on Eastern Hill. Kangaroos were often seen there. Describe what you see in this view of Collins St from around Spring Street. What would the country behind you be like? Imagine what the aborigines in the foreground are thinking as they look down over the developing town? What would Melbourne’s first Catholics have said (or not said) to them as they passed on the way to Mass in the wooden house at the eastern end of Little Collins Street. The aborigines, who had lived in the district, are already on the outskirts of town (see heading Early Settlement). Why did it happen that way? Read more. Meanwhile the whole Catholic population of Port Phillip had grown and Bishop Polding in Sydney named Fr James Alipius Goold first bishop of Melbourne. He was consecrated bishop in August 1848 aged only 36. James Alipius Goold was 36 when he was appointed first Bishop of Melbourne. Find out how old the bishops in Australia’s capital cities are now? What kinds of things do bishops do nowadays? (This site describing what an Anglican bishop does from day to day might help). Look at a page of Bishop Goold’s diary to see what kinds of things he did back in May 1850. What might be the advantages of having older bishops? What might be the advantages of having a younger bishop? Who is Melbourne’s present Archbishop, your local bishop? What work do they do? By 1853, two more Government land grants, for a Church, presbytery and school were made, making a rectangle of fives acres bordered by Gisborne, Albert, Lansdowne and Grey Street West (now Cathedral Place). Can you find this block on Google Earth and/or on a Melways map. How far is the cathedral site from (a) Parliament House, (b) St Francis’ Church, (c) the Town Hall? Fr Geoghegan chose this site not knowing that it would become the site of a great Cathedral. Why is it a good site? Are there any disadvantages? What if St Francis’ had remained the cathedral church of Melbourne as it was for the first years of Bishop Goold’s time? Bishop Goold laid the stone for the first St Patrick’s Church in April 1850. At this time, nothing grander than a good solid church was thought of. Though Melbourne was growing, it was still a modest settlement. Inside the stone was a bottle containing these words (in Latin) inscribed on a piece of vellum. See if your church or school has a foundation stone. Is it in Latin or English? What does it tell you about the beginnings of the building? Then came the gold rushes of the early 1850s. A very large percentage of Melbourne’s able-bodied men left for the goldfields to try their luck. Progress on St Patrick’s Church slowed almost to a halt. What’s going on in this picture? Where are these people going? What do you see that makes you think that? Imagine Bishop Goold watching these men leaving Melbourne. What might he be thinking and feeling? But the gold rushes also brought a huge increase in population. The first St Patrick’s was to have been a squarish church not unlike St Francis’. It had already cost Melbourne Catholics quite a lot of money but Bishop Goold realised Melbourne would need a larger church building so it was pulled down well before it was finished. Brainstorm what you know about the Victorian Gold Rushes and then explore some sites such as this one or this. What if the Gold Rushes had not happened? What would Melbourne be like now? Would the Catholic Church in Victoria be different? Suppose Bishop Goold had decided to stick with the original size and shape for St Patrick’s? What would Eastern Hill look like today? Screen 12 – Artist’s Impression of the projected second St Patrick’s. Work on the second St Patrick’s went ahead until, in February 1858, Bishop Goold blessed what was described as a ‘fairly decent church for a large provincial town’ and celebrated Mass in it. This is an artist’s impression of what the church would have looked like had it ever been finished. It had cost £9,000 pounds already but was still a long way off completion and there were difficulties with both the works and architects involved. £9000 (hundreds of thousands of dollars now) would have been a great deal of money when money was urgently needed in newly established Catholic parishes. Generally speaking, Catholics were working people who were generous but not well off. How was this money to be raised? Read this article from The Age March 1981 which described the efforts of Melbourne’s Catholics to respond to Bishop Goold’s requests. You are the parish priest at Portland. Write a brief note to the Bishop either offering a donation or explaining why you cannot send money just now. At this point Bishop Goold left on the visit that bishops made regularly to Rome, leaving his Dean, Fr John Fitzpatrick, in charge of affairs. Dean Fitzpatrick was to spend the rest of his life dedicated to St Patrick’s – it became his greatest passion. Dean Fitzpatrick was a key person in the history of St Patrick’s. He was associated with the initial planning and guided and supervised every aspect of his construction. Brainstorm to come up with as many tasks and responsibilities connected with the building and financing of a cathedral as you can. Compare your list with this. Look at this site about England’s Norwich Cathedral. See the Art and Architecture page on this site too. St Patrick’s Cathedral still has a Dean to look after its day to day affairs. Meanwhile, on his way to a new life in Australia was an exceptionally gifted Catholic architect William Wardell. Converted from Anglicanism in the great wave of English conversions to Catholicism in the mid 19th Century, he arrived in Melbourne in September 1858 with many letters of recommendation. William Wardell was an English Catholic. The Victorian Web has a helpful article on what it was like to be a Catholic in 19th Century England. He became a Catholic in 1843 at the age of 19. Find out his personal motto and explain what you think he meant by it. Identify five significant buildings in Melbourne that Wardell designed and locate them on a map. Prepare a walking tour brochure to introduce visitors to Wardell’s genius. At the same time that he was working on St Patrick’s he designed St Mary’s East St Kilda which became his own parish church. What is similar and what is different about these two designs? By November 1858, Wardell had drawn up plans for a magnificent building, such as the Catholics of Britain and Ireland had never dreamt of since the Reformation in the 16th Century. This plan shows how much bigger than the second St Patrick’s the new Cathedral was to be. Estimate how much larger the building envisaged in the new plan was than the previous one. Notice how much more creative it is architecturally. What’s actually involved in drawing plans today? Can the art or design students suggest how architects go about their jobs or do any of the students have parents who are architects who might be willing to visit your classroom and comment on Wardell’s design? Imagine the reaction of Dean Fitzpatrick when Wardell presented the new plans to him. You are a (very intelligent) fly on the wall: record the initial conversation between the two men. What might have been the Dean’s anxieties about the proposal? How might Wardell have defended his vision? Role play this exchange. Alternatively rough out the letter that Dean Fitzpatrick sent to Bishop Goold informing him of Wardell’s proposal and his personal response. ‘Marvellous’ Melbourne, stimulated by the wealth and population growth resulting from the gold rushes, was now a thriving city of half a million, of whom over a quarter were Catholics. So Bishop Goold gave the go ahead for Wardell’s visionary building. Though there was criticism and dissent, the partial demolition of the second St Patrick’s began and the third and final St Patrick’s began to take shape. This is how St Patrick’s looked in 1862, four years later. Create and record a sound-scape for a documentary on the building of St Patrick’s. You could simulate the sounds of the city at the time, arguments about the project, construction sounds, workers conversations/shouts, music that expresses the grandeur of the building or its ultimate purpose. Look at this site to see the tools used in building the great gothic cathedrals of Europe. Many of them (or adaptations of them) would have been used in building St Patrick’s. Have some cathedral fun here before exploring the rest of this great introduction to medieval cathedral building or finding out how the great arches so typical of gothic cathedrals are constructed. A large group of stone masons like these Richmond men and boys worked on the Cathedral over many years. There were some deaths including that of a 10 year old boy. The nave and the western facade of the Cathedral were completed in comparatively good time and the facade contains a wonderful stained glass image of the Ascension which is dedicated to the memory of Fr Geoghegan, Melbourne’s first priest who had died in 1864. By 1869, the Cathedral was in use for Mass and other large religious events. St John (at the right-hand side of Mary, Mother of God) has been depicted bearing Fr. Geoghegan’s features. This site displays the work of an artist who has sketched many Sydney buildings in detail and added a whimsical touch of his own often reflecting an aspect of the life of the building or what goes on inside it. Do the same for the façade of St Patrick’s. Or how about designing a modern Ascension window for the western façade using this geometry site to help you. What natural event, that happens at the end of every day in the western sky, is one reason why the western windows of many churches depict the Ascension of Christ? At this time the nave was walled off. School was held in this part of the Cathedral in the 1860s. Meanwhile the more complicated and expensive work on the transept and east end of the Cathedral (where the sanctuary and high altar are now located) went on. Churches were often used as schools in 19th and 20th Century Australia when Catholic people were struggling to establish both parish and school buildings. Perhaps your parents or grandparents attended school in a church building. Find out and interview your parents and/or grandparents about how it worked, especially what needed to happen on Friday afternoons and Monday mornings in order to convert the area into a place suitable for Mass and then back again. The paintings you can see hanging on the temporary wall in this picture were bought by Bishop Goold who loved collecting for his cathedral while in Europe. Two that you can see in this picture, St Ambrose and St Augustine, now hang either side of the main nave just inside the Cathedral doors. By 1880, the Catholic parishes and people of Melbourne had given generously for twenty years and money for the Cathedral had slowed right down. Strangely enough, an attempt on Archbishop Goold’s life by an unstable former associate in 1882 revived Catholic commitment to the Cathedral and work continued as the project neared its end. You are a newspaper reporter interviewing Fr Daley (who was walking with the Archbishop) after the attempt on the life of Archbishop Goold on August 21 1882 at Brighton. What are the questions you want to put to Fr Daley. Write an ‘factional’ account of the incident for August 22 1882 edition of the The Age. How would the Catholic people of Melbourne have felt about this incident as they read their morning papers? Archbishop Goold had a house at Brighton at this time, though his diaries show he often stayed in town for part of the week as well as keeping up visitation all over the diocese. Investigate the most likely route he would have taken from Brighton into St Patrick’s for Mass and other administrative and pastoral duties. How might he have travelled? Archbishop Bishop Goold died in 1886 but his successor Archbishop Thomas Carr pressed ahead. There were still many aspects and details of the interior that remained to be finished: groining, roofing, tiling, lighting, completion of the chapels and sacristies and furnishings. Produce a children’s ABC picture book on St Patrick’s Cathedral suitable for selling in the Cathedral Shop and using words associated with the history, personnel, building or equipment of the Cathedral. (If you are having trouble with Q, X or Z, how about Q for ‘quatrefoil’ a shape seen in some windows of St Patrick’s, X for the XP (Chi-Rho) symbol representing Christ which can be seen in many places in the Cathedral and Z for zucchetto which is worn on a bishop’s head? While Archbishop Carr arrived in 1886 during Marvellous Melbourne‘s Boom time, the Bust was just around the corner and once again work on the Cathedral slowed right down. The Archbishop himself spearheaded fundraising for the Cathedral, travelling round the diocese pleading for support, opening fetes and bazaars, inviting the various professions and trades to donate and by hosting a huge month-long Celtic Fair at the Exhibition Buildings in 1894. All the parishes had stalls and sporting contests and arts and cultural events were held. It was a huge success despite the recession. School pupils donated to St Patrick’s too. Saint Brigid’s Chapel celebrates their generosity. How would you go about raising money for such a project if you and your school were asked to help pay off the cathedral nowadays? Does your parish or school have a debt? If so, see if you can organise a really interesting fund raising event to contribute to paying it off. What steps will you need to take to make it successful? The consecration of a Cathedral is a long and complicated ceremony. To help you imagine the ceremony look at the description and some pictures of the consecration of Westminster Cathedral in London in 1910, thirteen years after St Patrick’s. The two ceremonies would have been very similar. The spires with which we are so familiar and which symbolise the Cathedral for many were not raised until 1939 during the episcopate of Archbishop Daniel Mannix. Archbishop Mannix was leader of the Catholic Church in Melbourne from 1917-1963 and is probably the most historically significant Church leader in Australian history so far. List ten interesting facts about him. What were three major events in world history that happened during his time as Archbishop? Find out how many Prime Ministers led Australia during his time and give their names and dates. The spires, clearly visible behind Parliament House are much taller than those envisaged by Wardell and the tallest is surmounted by a cross given by Ireland’s President de Valera. Why do so many cathedrals and churches have spires? Using rolled up newspapers, can you design and build a two metre tower that ends in a spire. Why is it so appropriate that the enormous cross that caps the tallest spire (it is made of Australian bronze) was given as a gift by the President and people of Ireland? What shops can you see in Bourke Street? What do your parents or grandparents remember about these shops? What has changed in this picture compared to the one in the next screen? Do you think the spires of St Patrick’s Cathedral ever be built out of the Bourke St view of them? Imagine this view in 100 years time, in 500 years time. Write or draw about these future scenarios. St Patrick’s Cathedral still stands on the Eastern Hill of Melbourne, a tribute to the energy, vision and confidence of Archbishop Goold (and his successors), of the architect William Wardell, of Dean John Fitzpatrick and to the faith and generosity of Melbourne’s first and second generation Catholics. The acceptance of the impressive plan for St Patrick’s submitted by Wardell symbolised the new self confidence and material flourishing of Catholics, particularly Irish Catholics in Australia. In a community where the old restrictions on the public and religious lives of Catholics no longer existed, Irish Catholics found themselves prospering and, in the egalitarian society of early Melbourne, suffering much less from either religious prejudice or social exclusion than they had in the old world. So much so that Sir John O’Shanassy, a prominent Catholic, became the colony’s second Premier. St Patrick’s, for all its glory, has never supplanted St Francis as the mother church of Melbourne Catholics. St Francis’ hums with activity every day as people call in to pray, to attend Mass or simply to sit in the presence of God in its comfortable space but the Cathedral, its beauty, its size and solidity, represents the pride in their faith, and its traditions, of Melbourne Catholics. As T.P Boland says in his book St Patrick’s – a Life: ‘Architecture reveals our view of our place and purpose in the world’. It is an apt comment on what St Patrick’s Cathedral meant, and still does mean, to Melbourne’s Catholics. What would you say St Patrick’s means to 21st Century Melbourne Catholics? What does it say about our view of ourselves and our purpose in the life of the city? Explore the Cathedral itself in the companion to this unit entitled Visit St Patrick’s Cathedral.